The Dassault Falcon 7X is a large-cabin, 5,950 nmi range business jet manufactured by Dassault Aviation, the 2nd largest of its Dassault Falcon line. Launched at 2001 Paris Air Show, its first flight was on 5 May 2005 and it entered service on 15 June 2007. The Falcon 8X is derived from the 7X with a longer range of 6,450 nmi afforded by engine optimizing, aerodynamic refinements and an increase in fuel capacity. Featuring an S-duct central engine, it and the Falcon 900 are the only two trijets in production. Dassault launched the FNX at the 2001 Paris Air Show, aiming for a 10,500km (5,700nm) range at Mach 0.88 up from the Falcon 900EX 8,300km at Mach 0.84. Its new high-speed wing is 1.86m (6.10ft) longer with 5° higher wing sweep than the 900 wing, while its 20% longer fuselage is keeps the same cabin cross-section but with a new curved windscreen. The trijet has a combined thrust of 18,000lb (80kN) provided by Honeywell FX5s, a new design, or a Pratt & Whitney Canada PW306 growth version. Based on Honeywell Primus Epic avionics, its EASy cockpit is developed for the Falcon 2000EX and 900EX and controls are fly-by-wire. Scheduled to fly in 2004, first deliveries were planned for mid-2006. With 41 deposits, it was named 7X in November with first flight slipping from late 2004 to early 2005 and certification planned for mid-2006. With a simplified structure to reduce cost and weight, the optimised high-transonic wing improves by more than 10% the lift-to-drag ratio over the supercritical-section wing of the Falcon 50 shared by previous Falcons. The cabin is 2.4m (8ft) longer than the 900 and have a lower 6,000ft (1,800m) cabin altitude. the 6,100lb-thrust (21.7kN) PW307A was finally selected, among other risk-sharing partners: Honeywell for avionics architecture, auxiliary power unit, air management system; with Parker Hannifin for the power generation system and wheels brakes; and TRW Aeronautical Systems for the hydromechanical flap and airbrake systems. With over 50 firm orders, it completed its first flight on 5 May in 1h 36min from Bordeaux-Merignac, starting a 1,200h flight test programme over 15 month: it climbed to 10,000ft (3,000m) for hydraulic, fuel, air data and landing gear extraction/retraction systems tests, then climbed to 25,000ft for acceleration/deceleration tests and basic autopilot and autothrottle operations. The second Falcon 7X should join in June, and the third with a full interior in September for long-range, endurance tests and interior sound level validation: Dassault aims for a 52dB sound level in the cabin, 4dB lower than other Falcons. Certification slipped to late 2006 and first deliveries to early 2007. It was first presented to the public at the 2005 Paris Air Show. The aircraft has received its type certification from both the Federal Aviation Administration and European Aviation Safety Agency (EASA) on 27 April 2007. The first 7X, MSN05, entered service on 15 June 2007. The hundredth was delivered in November 2010. It conducted high altitude airport tests at 14,500 ft in Daocheng in 2014. In 2001, the Falcon 7X, at approximately $35 million (preproduction order price), was nearly $10 million cheaper than its nearest competitors in the long-range, large cabin market segment, including the Gulfstream G550 and Bombardier Global Express. It was targeted to be priced for 2004 at 12% more than the $33 million top-of-the-range Falcon 900EX equipped: $39.6 million. Its price was $37 million in 2005, and $41 million in 2007. In 2017, its list price was $54M, a 3-4-year-old 7X was worth $27-34m and a 7-9 year old one cost $19-24M. The Falcon 7X is a three-engined cantilever monoplane with a low-positioned, highly swept wing. It has a horizontal stabiliser at mid-height and a retractable tricycle landing gear, and three rear-mounted Pratt & Whitney PW307A turbofan engines : two on the side of the fuselage and one in a center position, and room for 20 passengers and two crew. It is the first production Falcon jet to offer winglets. It is the first fully fly-by-wire business jet and is equipped with the same avionics suite, the Honeywell Primus Epic "Enhanced Avionics System" (EASy), that was used on the Falcon 900EX and later on the Falcon 2000EX. EASA grounded the Falcon 7X fleet after a report from Dassault Aviation regarding an uncontrolled pitch trim runaway during descent in one of its jets in May 2011. The aircraft pitched up to 41 degrees, with the load factor increasing to 4.6g, it climbed from 13,000 to 22,500 ft and the airspeed went from 300 to 125 kn. "This condition, if occurring again, could lead to loss of control of the aeroplane," the EASA notice said. Initial results of investigation showed that there was a production defect in the Horizontal Stabilizer Electronic Control Unit which could have contributed to the cause of the event. Dassault Aviation developed modifications in June 2011 to allow a return to flight. After four years of investigation, the Bureau d'Enquêtes et d'Analyses pour la Sécurité de l'Aviation Civile published its final report in June 2016. 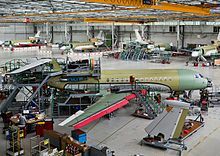 It was found that incorrect nose-up commands to the trimmable horizontal stabilizer were caused by a soldering defect on the pin of its electronic control unit provided by Rockwell Collins. On May 2, 2014, Dassault Falcon pilots Philippe Deleume and Olivier Froment set a new speed record for the Falcon 7X on a 5 h 54 min flight from New York Teterboro Airport to London City Airport with three passengers on board. The 6,450 nmi (11,945 km) range Falcon 8X was announced at the European Business Aviation Convention & Exhibition in May 2014. Its cabin is 3.5 feet longer than the 7X. With improvements to wing design and improved Pratt & Whitney Canada PW300, the 8X is up to 35% more fuel efficient than its competitors. The prototype, registered F-WWQA, first flew from Bordeaux–Mérignac Airport on 6 February 2015. The Falcon 8X was added as a subtype of the Falcon 7X on the EASA type certificate on 24 June 2016 as modification M1000 for S/N 0401 and ongoing. Dassault delivered the first Falcon 8X on 5 October 2016 to Greek business aviation operator Amjet Executive. By October 2018, the Falcon 8X FalconEye EFVS was approved by the FAA and EASA for approaches down to 100 ft (30 m), and dual HUD FalconEye will allow EVS-to-land in 2020, without using natural vision. More than 260 Falcon 7X have been delivered between mid-2007 March 2016 and the fleet was flown more than 440,000 hours. 117 aircraft are in Europe, 45% of the fleet: 18 in Switzerland, 13 in France, eight in Luxembourg, seven in Belgium, Denmark, Germany and Portugal, six in Russia, four in Ukraine among others. Antwerp's Flying Group operates five aircraft, Shell Oil has four in Rotterdam and Dassault Falcon Service at Paris-Le Bourget manages four, as does Volkswagen AG in Wolfsburg. 20% of the fleet is in North America: more than 50 in the U.S., six in Canada and five in Mexico. In Asia-Pacific, 14 are in Hong Kong and 11 in China among others. Royal Australian Air Force : three Falcon 7X leased for VVIP missions. Ecuadorian Air Force : One Falcon 7X (ID: FAE 052) for long-distance travel along the presidential Embraer Legacy 600. Delivered November 4, 2013; first official trip November 25, 2013. Escadron de transport 60 (government members air transport) : 2 Falcon 7X. Being used primarily by then-president Nicolas Sarkozy, the first shipped airplane was nicknamed "Carla One" by French newspapers, in reference to Carla Bruni, then French First Lady. Albert II, Prince of Monaco - one Falcon 7X since 2013. ^ a b c "Falcon 7X completes its first flight". Flight International. 17 May 2005. ^ a b "MAIDEN FLIGHT: "Smooth" sortie opens Falcon 8X test campaign". Flight Global. 6 February 2015. ^ a b "Falcon 7X enters service". Flight Global. June 15, 2007. ^ a b "Dassault delivers first Falcon 8X to Greece's Amjet Executive". Flight Global. October 6, 2016. ^ a b c d "Operators Survey: Dassault Falcon 7X". Business & Commercial Aviation. Aviation Week. March 24, 2016. ^ William Garvey (May 19, 2014). "Dassault Expands Falcon Family With 8X". Aviation Week. ^ "Dassault unveils long-range Falcon". Flight International. 26 June 2001. ^ a b "Dassault unveils Falcon 7X long-range business jet". Flight International. 6 Nov 2001. ^ "Dassault Falcon 7X Earns EASA and FAA Certification" (Press release). Dassault Falcon. April 27, 2007. ^ "Dassault scores a century with 7X". Flight Global. 26 November 2010. ^ "The Costs to Own and Operate a Falcon 7X". SherpaReport. 13 June 2017. ^ a b c d "type certificate data sheet" (PDF). EASA. 24 June 2016. Archived from the original (PDF) on 15 August 2016. ^ "Pilot Report On Falcon 7X Fly-By-Wire Control System". Aviation Week & Space Technology. May 3, 2010. ^ "Dassault Aviation and Dassault Systèmes Make Industry History -- Falcon 7X Jet Becomes First Aircraft Entirely Developed on Virtual Platform" (Press release). Dassault Systèmes. May 24, 2004. ^ "Dassault's Falcon 7X BMW Interior Option Wins Design Award" (Press release). February 5, 2010. ^ Mark Huber (May 2017). "Dassault Falcon 7X". Business Jet Traveler. ^ Sarsfield, Kate (26 May 2011). "EASA grounds Dassault Falcon 7X after pitch trim incident". Flight Global. ^ "EASA Grounds Falcon 7X Fleet". Aviation Week. May 26, 2011. ^ a b "Serious incident to a Dassault Falcon 7X, registered HB-JFN on 05/24/2011 at Subang (Malaisie)". Bureau d'Enquêtes et d'Analyses pour la Sécurité de l'Aviation Civile. June 13, 2016. ^ "Emergency Airworthiness Directive No. 2011-0102-E". EASA. May 26, 2011. ^ "Emergency Airworthiness Directive 2011-0114-E". EASA. 16 June 2011. ^ "Dassault says Falcon 7x is now back in the air". Reuters. June 16, 2011. ^ Haria, Rupa. "Falcon 7X Sets New Speed Record". Aviation Week. ^ "Dassault Aviation Reveals First Falcon 8X" (Press release). Dassault Aviation. December 17, 2014. ^ Matt Thurber (October 9, 2018). "FAA, EASA OK Dassault 8X EFVS Down to 100 Feet". AIN online. ^ Waldron, Greg (8 April 2019). "RAAF to lease three Dassault 7X for VVIP mission". Flight Global. Singapore. Archived from the original on 8 April 2019. Retrieved 8 April 2019. ^ "Escadron de transport 60" (in French). French Air Force. 11 August 2016. ^ "Voici "Carla one", le nouvel avion de Sarkozy" (in French). Le Parisien. July 10, 2009. ^ "Le nouvel avion de Nicolas Sarkozy" (in French). Le Point. July 9, 2009. ^ "Egy harmadik Airbust és további repülőket vesz a honvédség" (in Hungarian). Euronews. 12 December 2018. ^ "Albert s'offre l'avion de ses rêves" (in French). Paris Match. 5 March 2013. ^ "Government defends new Falcon". The Namibian. March 18, 2009. ^ "Egypt to buy 4 Falcon 7X from Dassault for $337M". Ecofin Agency. 18 August 2016. ^ "Dassault Aviation vend quatre Falcon 7X à l'Egypte" (in French). La Tribune. 20 August 2016. ^ "Falcon 7X". Dassault Aviation. ^ "Falcon 8X". Dassault Aviation. ^ "Business Airplanes Purchase Planning Handbook" (PDF). Business & Commercial Aviation. Aviation Week. May 2016. Wikimedia Commons has media related to Dassault Falcon 7X and Dassault Falcon 8X. J. Mac McClellan (October 26, 2008). "Falcon 7X Pilot Report". Flying Magazine. Fred George (May 3, 2010). "Pilot Report On Falcon 7X Fly-By-Wire Control System". Aviation Week & Space Technology. "Pilot Report: Dassault Falcon 8X". Business & Commercial Aviation. Aviation Week. October 29, 2015. Fred George (April 2016). "Operators Report: Falcon 7X" (PDF). Business & Commercial Aviation. Aviation Week. p. 50. "Type certificate data sheet No. A59NM" (PDF). FAA. June 27, 2016. Matt Thurber (January 10, 2017). "Pilot Report: Falcon 8X" (PDF). Aviation International News. This page was last edited on 15 April 2019, at 16:01 (UTC).